Situated in the south of Nottinghamshire, the city is renowned for its lace-making history – where at one point during the Victorian era it was the world’s leading centre for the production of the textile. 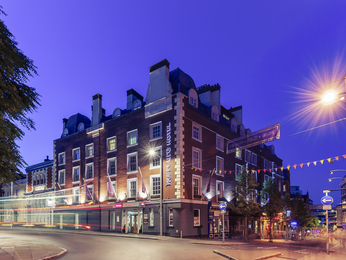 Located by Lace Market Square in the centre of town, our Nottingham Mercure is perfect for you, whether you are in town for business or planning a weekend away. If looking for some history during your stay, head to the City of Caves by the intu Broadmarsh shopping centre. The attraction consists of a network of caves, carved out of sandstone, that run deep underground throughout the city. Take an actor led tour and discover their uses over the years – including as air raid shelters during the Second World War. Alternatively, stroll south west of the centre to the city’s castle’s grounds. Originally the site of a Norman castle built in 1067 on the orders of William the Conqueror, the area is now home to a 17th century manor that houses a museum and fine art gallery. Outside the castle you will also find a statue in commemoration of Robin Hood – the heroic outlaw who is portrayed as robbing from the rich and giving to the poor. Before returning to one of our luxurious hotels in Nottingham’s centre, don’t miss the chance to sample a brew at Ye Olde Trip to Jerusalem. Carved into the cliffs below Nottingham’s castle, it claims to be England’s oldest pub and may have even been the watering hole of choice for Robin and his merry men.